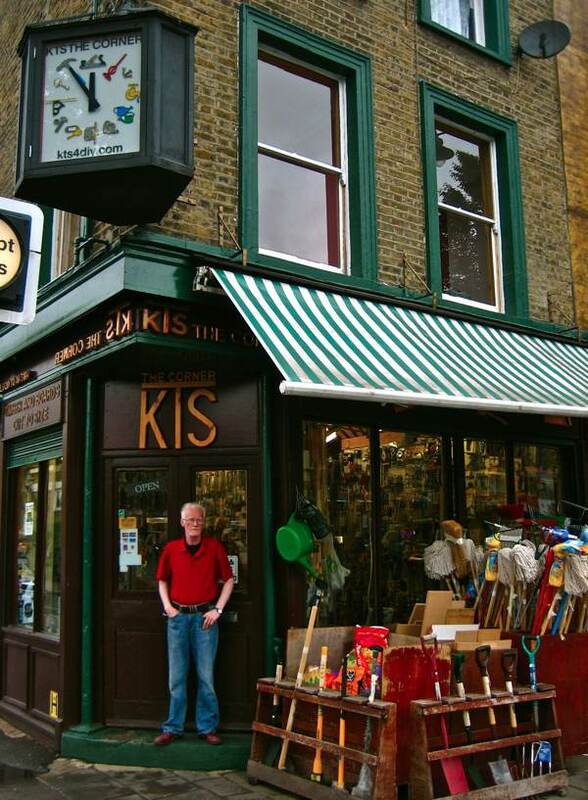 Everyone in East London knows KTS The Corner, Tony O’Kane’s timber and DIY shop. With Tony’s ingenious wooden designs upon the fascia and the three-sided clock he designed over the door, this singular family business never fails catch the eye of anyone passing the corner of the Kingsland Rd and Englefield Rd in Dalston. In fact, KTS The Corner is such an established landmark that it is “a point of knowledge” for taxi drivers. Yet, in spite of its fame, there is an enigma about KTS which can now be revealed for the first time. “People think it stands for Kingsland Timber Service,” said Tony with a glint in his eye, “Even my accountant thinks it does, but it doesn’t – it stands for three of my children, Katie, Toni and Sean.” And then he crossed his arms and tapped his foot upon the ground, chuckling to himself at this ingenious ruse. It was entirely characteristic of Tony’s irrepressible creative spirit which finds its expression in every aspect of this modest family concern, now among the last of the independent one-stop shops for small builders and people doing up their homes. 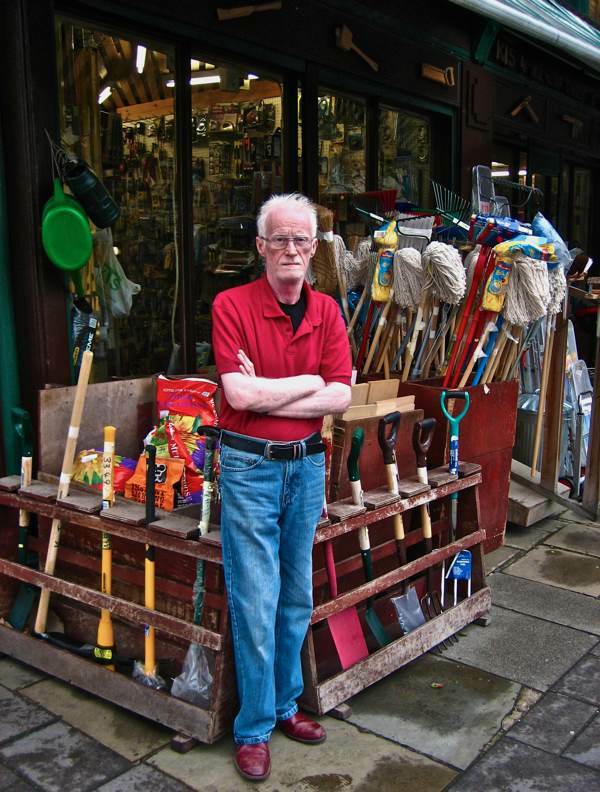 On the Kingsland Rd, Tony’s magnificent pavement display of brushes, mops and shovels, arrayed like soldiers on parade, guard the wonders that lie within. To enter, you walk underneath Tony’s unique three-sided clock – constructed to be seen from East, South and North – with his own illustrations of building materials replacing the numerals. Inside, there are two counters, one on either side, where Tony’s sons and daughters lean over to greet you, offering key cutting on your left and a phantasmagoric array of fixtures to your right. Step further, and the temporal theme becomes apparent, as I discovered when Tony took me on the tour. Each department has a different home made clock with items of stock replacing the numerals, whether nails and screws, electrical fittings, locks and keys, copper piping joints, or even paints upon a palette-shaped clock face. Whenever I expressed my approval, Tony grimaced shyly and gave a shrug, indicating that he was just amusing himself. Rashly, Tony left his sons in charge while we retired to his cubicle office stacked with invoices and receipts where, over a cup of tea, he explained how he came to be there. “I’m from from Hoxton, I went to St Monica’s School in Hoxton Sq. To get me to concentrate on anything they had to tie me down, but, if anything physical needed doing, like moving tables and chairs, I’d be there doing it. My dad did his own decorating and my mother wanted everything completely changed every year or eighteen months, so he taught me how to hang wallpaper and to do lots of little jobs. After Cardinal Pole’s Secondary School, I did an apprenticeship in carpentry and got a City & Guilds distinction. Starting at fifteen, I did four years apprenticeship at Yeomans & Partners. Back then, when you came out of your apprenticeship, they made you redundant. You got the notice in your pay packet on the Thursday but on Saturday you’d get a letter advertising that they needed carpenters at the same company. They wanted you to work for them but without benefits and you had to pay a weekly holiday stamp. I went self-employed from that moment. At the age of nineteen, I started my own company. I covered all the trades because I learnt that the first person to arrive on a building site is a carpenter and the last person to leave the site upon completion is a carpenter. Nine out of ten foremen are ex-carpenters and joiners, since the carpenter gets involved with every single other trade. So, over the years, I picked up plumbing, heating, electrics. When I started my company, I wouldn’t employ anyone if I couldn’t do their job – so I knew how much to pay ‘em and whether they was doing it right or wrong. Tony is proud to assure you that he stocks more lines than those ubiquitous warehouse chains selling DIY materials, and he took me down into the vast cellar where entire aisles of neatly filed varieties of hammers and hundreds of near-identical light fixtures illustrated the innumerable byways of unlikely creativity. At the rear of the shop, through a narrow door, I discovered the carpentry workshop where resident carpenter Mike presides upon some handsome old mechanical saws in a lean-to shed stacked with timber. He will cut wood to any shape or dimension you require upon the old workbench here. 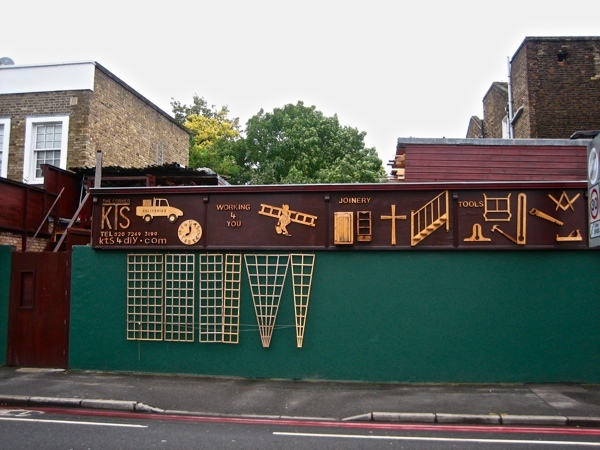 Tony’s witty designs upon the Englewood Rd side of the building are the most visible display of his creative abilities, in pictograms conveying Plumbing & Electrical, Joinery, Keys Cut, Gardening and Timber Cut-to-Size. When Tony took these down to overhaul them once, it caused a stir in the national press. Thousands required reassurance that Tony’s designs would be reinstated exactly as before. It was an unexpected recognition of Tony’s talent and a powerful reminder of the secret romance we all harbour for traditional hardware shops. Tony with his sons Jack and Sean. A magnificent pavement display of brushes, mops and shovels. The temporary removal of Tony’s wooden pictograms triggered a public outcry in the national press. Ah, the magical smells and cornucopia of the hardware shop – one of my most enduring and beloved childhood memories. And this for someone who’s rubbish at all forms of DIY. My idea of heaven. 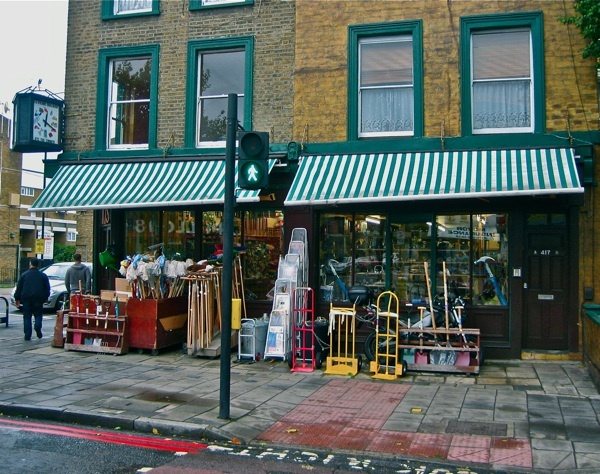 When I was a child growing up in Dartmouth my mother took me to an ironmongers just like this,it sold everything usefull,here I learnt about so much,quality of paintbrushes,sizes of screws etc etc. knoledge that helps cope with everyday life .Sad that there are so few shops like this now but here on the IW we still have Hursts who will still sell you a single screw if that is all you need. So sad to see these shops and the advice and help offered end. I’ve used and lived by this shop for years – it is as amazing as TGA says… And all his kids that work there are lovely and knowledgeable too. Thank God he owns it – so it stays put. Loved this. I lived nearby for 23 years and passed this shop numerous times but never – to my shame – went in. Next time I’m in London I’m going to make a point of visiting and buying something. GA, what a heartening story about Tony Kane and KTS The Corner. Lucky for him that his energies were directed since boyhood into a meaningful job trajectory on which he put his unique stamp. Good luck to him and his offspring in keeping this enterprise viable in this age of the “big box” stores. Oh what a lovely shop! I am green with envy. We used to have a little shop like this, (smaller) in Penzance, redolent with the smells of wax polish and paint and oil. It was called Wilton & Nichols and there seemed to be an inexhaustible supply of old men in almost ankle length grey warehouse-coats who’d often say, in broad Cornish, “Well, let me see, we haven’t got one of those but we’ve got summat that will do just as well!” and they’d lead one off into the back rooms, winding from stock stored room to the next until they found something with the dust of ages on it, and d’you know what, it always did just as well! I even found a matched pair of lacquered, Japanese Travelling Alter Plaques, with little fold out shelves for offerings and incense etc. Nobody knew how they came to be in there but I got them for a tenner! Shops like that should be declared national treasures and encouraged to stay! Than you for this trip down memory lane! THIS is exactly why I love starting my day with you, GA.
provoke the fervent wish to actually MEET the people you introduce us to, on a daily basis. Hurrah and huzzah for the spirit behind this one-of-a-kind Emporium of Wonderful. Frankly, it looks like it would be worth the trip from anywhere. It is good to see these little D.I.Y. shops surviving in these days of warehouse stores. 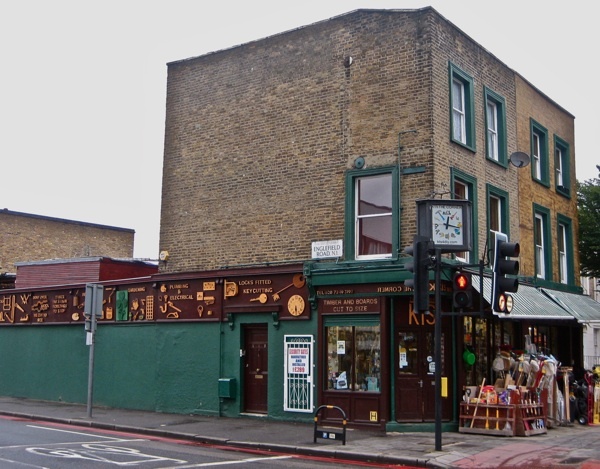 Another of these is Thompson’s in Roman Road, E.3, This was started by Kenny and Phyllis Thompson on a stall in Roman Road Market just after the war and is still going ran by their children Mark and Annie. Four candles? No, fork handles. Handles for forks. Got any plugs? What sort? Rubber ones for bathrooms. What size? 13amp………. Sorry GA couldn’t resist that. KTS looks a super shop, the kind of place where I can always find something to buy. Thank you for telling us about it! Ah GA, you are so right when you talk about the secret romance we harbour for old fashioned hardware shops! We can all immediately recall that wonderful smell – paint, wax, string, turps. It is so difficult to define but wonderful in its complexity. I know if I walked into KTS and asked for one No 6 chrome raised head 5/8″ Tony would immediately be able to produce it. 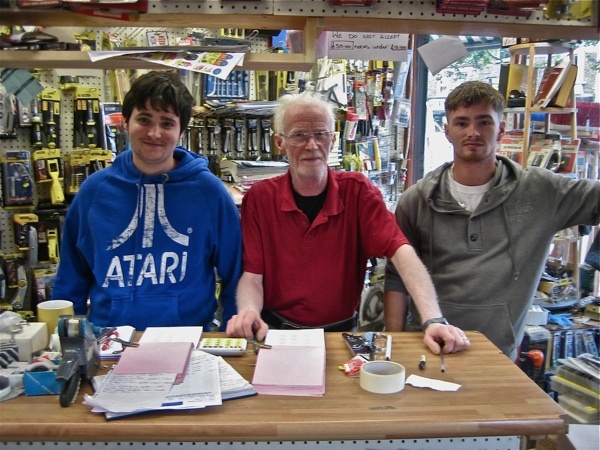 These hardware shops are now hard to find and those that remain are under threat. 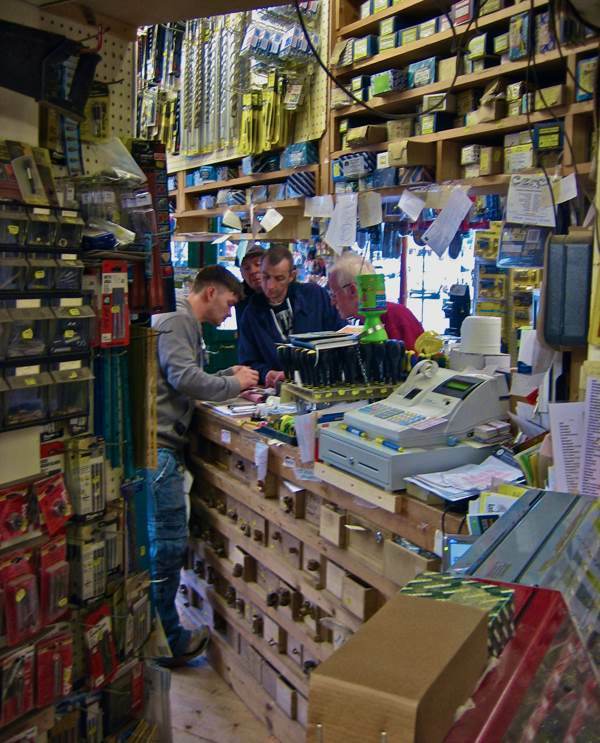 I guarantee a book about “proper” hardware stores of the UK would be a best seller! Clearly other readers have their favourites too and I have loved reading their comments. Thanks Richard for reminding us of the wonderful “Four Candles” sketch by the inimitable Two Ronnies. Allegedly H E Harringtons a hardware store in Broadstairs, Kent was the inspiration for this. In case any readers are wondering to what Richard is referring just search for “Four Candles” on You Tube. Even after more than forty years it remains one of the UKs favourite comedy sketches – it even has its own Wikipaedia entry! Testament to our love for great comedy and hardware stores.